On Jan. 6 or Twelfth Night, also known as the Epiphany (Święto Trzech Króli), Poles take small boxes containing chalk, a gold ring, incense and a piece of amber, in memory of the gifts of the Magi, to church to be blessed. 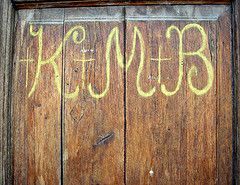 Once at home, they inscribe the date and "K+M+B+" with the blessed chalk above every door in the house to protect against illness and misfortune for those within. For 2018, it would look like "20 K+M+B+ 18." The letters, with a cross after each one, stand for the names of the Three Kings—Kaspar, Melchior, and Balthasar. They remain above the doors all year until they are inadvertently dusted off or replaced by new markings the next year. A King Cake with a lucky coin or almond is baked on this day. The one to receive the piece with a coin or almond must host the next party. The Feast of the Three Kings ends the swiete wieczory—the twelve holy nights that began on Christmas Day—and signals the beginning of zapusty or karnawal (carnival season) that precedes Lent and then Easter. King Cake parties became a tradition in Western Europe during the 17th century. Settlers from France and Spain brought it to the southeastern United States, particularly Louisiana, where it remains "king" today. Although king cakes in most parts of the U.S. are usually eaten on Fat Tuesday or Mardi Gras, they were meant to be the go-to dessert from Jan. 6 (Three Kings Day) through Fat Tuesday. And that's how they still do it in Louisiana, Texas and other parts of the South. The tradition of hiding a ceramic baby Jesus (or plastic baby after the cake is baked) or bean or silver coin inside the king cake seems to be a common practice regardless of the country or ethnicity of the baker. Whoever gets the slice of cake with the baby, bean or coin hidden inside is king for the day but must provide the cake at the next party.